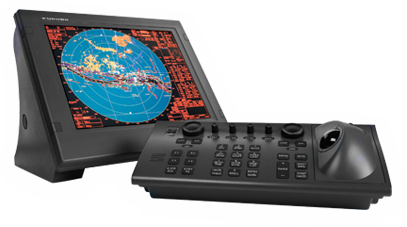 The MU190 display unit employs a 19" Color DVI-D LCD, providing an effective picture diameter of larger than 250 mm. 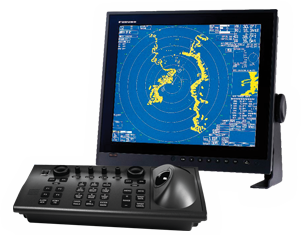 The SXGA monitor provides crisp radar echoes, which are presented in a selected color with a day or night background color for easy observation all lighting conditions. Different colors are assigned for marks, symbols and texts for user-friendly operations. Target detection is enhanced by sophisticated signal processing techniques such as multi-level quantization (MLQ), echo stretch, echo average, and radar interference rejecter. Two guard zones can be set at required ranges in any sector. Other ship's movements are assessed by advanced target tracking software and alerted by CPA/TCPA data readouts. 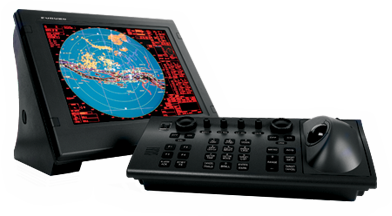 The FAR21x7 series provide ARPA and AIS (transponder unit is required) function as a standard. For X-band models, a variety of antenna is selectable from; 4, 6.5, 8 foot radiator, and antenna rotation speed is selectable from 24 rpm for standard radars or 42 rpm for HSC. The S-band radar FAR2137S is also available with the antenna radiator 10 or 12 feet. The S-band radar assures target detection in adverse weather where X-band radar are heavily affected by sea or rain clutter. When pedestal mounting the standard FAR21x7 display unit MU190, the FAR2XX7PED requires use of the optional display mounting kit FAR-190-BKT, which includes the 008-535-560 bracket and 001-139-360 mounting assembly. Please note that the FAR-190-BKT kit is NOT supplied with the MU190 when the monitor is purchased as an individual component. When retrofitting for an older FAR21x7 monitor installation with an existing 008-535-560 bracket, the use of the 001-139-360 mounting assembly only is required. The FAR2XX7 series radar maximum signal cable length using standard cable (RW9600) is 100M. For cable runs of between 101M and 200M, use P/N CBL-2X7-200 (200 meter cable). For cable runs of between 201M and 300M, use P/N CBL-2X7-300 (300 meter cable). Installation should include two optionally available junction boxes, P/N CBL-2X7-BOX. List Price Credit for Standard Antenna Motor Assembly is $650.00. The fee to perform the 42 RPM motor conversion is three hours at the current labor rate. Display Handles for FAR2XX7 Displays MU190 and MU231, 2 each.